If you cook you would know that sometimes cooking disasters happen. Maybe you are frying fish and when you are about to turn it the other way around, you find that the fish is stuck with the pan and eventually the fish tears in the middle. There is nothing better than having the perfect fish fry or omelet on your dinner table. But things always don’t work out the way you want because of the pan you are using for cooking. The cookware manufacturers have experimented over the years and came up with lots of innovative solutions for your kitchen. As we have to use cooking pans quite often, you will see various kinds of pans in the market. The concept of non-stick pan’ isn’t new. It has been popular for years for its on-sticky’ nature. Food is easy to cook on the non-stick pan as you can easily toss and turn the food without ruining its look. It is also easy to clean as no food gets stuck on it. Another advantage of non-stick pans is that you need to use less oil or butter for cooking. So, if you are following a healthy lifestyle then you will definitely benefit from having a non-stick pan. Recently, you must have heard about the Granite Rock Pans. The pans look beautiful, just like the original granite stones. They are non-stick in nature and come with lots of more advantages in comparison to the Teflon non-stick pans. 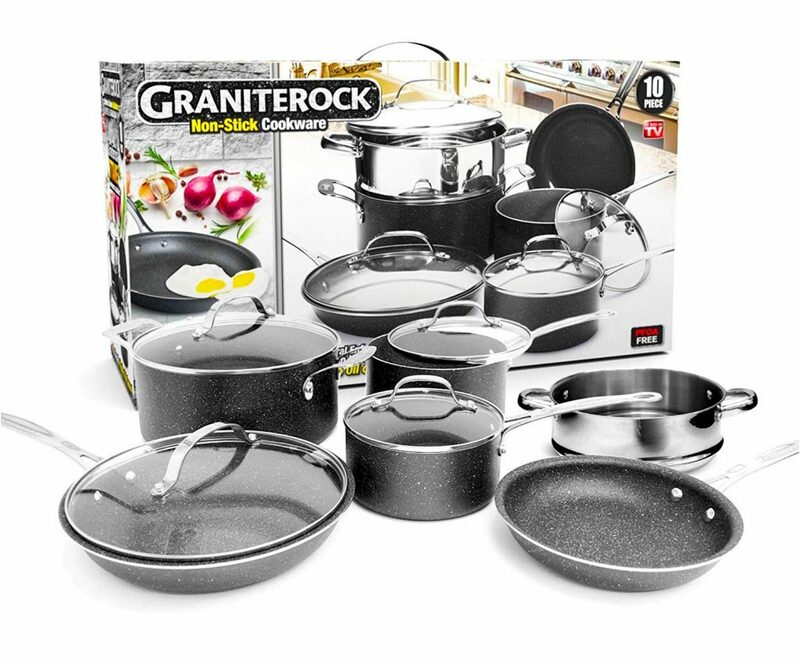 Here, we are going to look at the review of the new granite rock Non-stick, No-warp, Mineral-enforced Frying Pans PFOA-Free’ and know more about the modern Granite Rock Pan. 5.1 Is the pan made out of real granite? 5.2 Is it safe to use? 5.3 Is it any better than the other pans? Graniteware is not something new. It was available from the 1870s until the end of World War II. Those graniteware items were manufactured using iron or tin. Those were heavier as many layers of glass coating were added. One of the main reasons graniteware became popular is because it had a glass surface, but was strong as metal. The surface was glossy and so it was easy to maintain. The modern graniteware kitchen pieces are made of glass coating and steel core. The glass surface is created by fusing porcelain enamel with metal at a very high temperature of 2,000 F. This creates an inert and non-stick surface. Unlike before the graniteware items are now thinner and lightweight and so are more convenient to use. Before the popularity of modern graniteware, Teflon non-stick pans were most demanding in the market. But those pans were coated with polytetrafluoroethylene or Teflon. There has been a rumor that Teflon is toxic. It was thought that the non-stick coating of the pan might come off and people might accidentally ingest it. There is no such rumor about graniteware kitchen items and so they are safe to use. If you have seen the TV commercial of this product, I’m sure you will be convinced that there is no other non-stick pan like this one. In the commercial, it shows that you don’t need to use any oil or butter to make omelets or to fry fish. Food gets cooked in and out perfectly without even a drop of oil. It also shows that the food comes off so easily that you don’t even need to use a spatula to take out the food from the pan. You can just tilt your pan near your serving plate and the food will automatically roll down on the plate, leaving no residue behind. The pan will look perfectly clean as if you didn’t cook anything. In order to prove how non-sticky the pan is, some sticky candies were placed on the pan. As it melted, it came out of the pan smoothly without making the pan sticky. The Granite Rock Pan is also very durable. The manufacturer says that even after a lot of abuse the pan will still be in good condition. As an example, in the advertisement granite rock, it is shown that rock is being smashed with a hammer on the pan and there was no sign of damage on the pan. The pan is also scratch-free. Even if you scratch it with sharp objects like a knife, it won’t leave any scratch mark. One of the main reasons people why like this pan is because of the external appearance. It simply looks beautiful and you will definitely enjoy cooking using it. The size of the pan is very convenient. Its specifications are 10-inch X 17-inch X 1.5-inch depth. It has triple food-grade granite layers. So, it will last you for many years without any damage. It has a coating of high-grade natural mineral which makes it the best non-stick pan. For high heat conductivity it has pressed aluminum inner layer. It also allows even surface heating which is a must for cooking foods like steaks. The handles are made such that they stay cool even when you are cooking on high heat. It is oven-safe and can withstand a temperature of up to 2600C or 5000F. That means you can also bake different types of food using this pan. This non-stick pan is perfect for frying, baking, browning, searing, etc. It can resist any scratch or other abuses, making it wonderful cookware. The pan is very lightweight and so you can easily carry it around. As it’s totally non-stick, you will be able to cook without any mess. No butter or oil required for frying egg or fish. So, it is perfect for healthy cooking. The heat is distributed fast and evenly during cooking because of the inner carbon steel core. Your cooking time is reduced because the surface of the pan absorbs heat quickly. It is scratch resistant, so you can use any spatula to toss and turn your food. Cleaning is very simple. You can easily put it in your dishwasher or wash it by hand as well. Just wipe it with a paper towel and then use hot water and dish soap to clean it. You can buy it only for $19.95. You also get a number of freebies along with it. The handle is designed such that you get a firm hold. Granite surface doesn’t wear off easily and so it is more durable than Teflon. It is PFOA, PTFA, cadmium and lead free. So, it won’t pose any danger to your health. You can use it for both frying, cooking and baking. You get a free single egg fry pan with it. When overheated, no toxic fume is given out. It may not be safe to use it on glass surfaced stoves. The cooktop may crack. As the modern graniteware kitchen items are thinner, these may be prone to chipping when dropped accidentally. Though the manufacturer of this pan has claimed that the pan is absolutely non-stick, many users have complained that it’s actually not. They found food stuck to the pan. Here are some common questions people ask about this product. The answers to these questions will help you to know more about the product. Is the pan made out of real granite? The pan is not made of granite; it only looks like it. The granite-like coating is used for making this pan. The Granite Rock pan has a glass coating that is free of any harmful chemical. There won’t be any reaction with food. So, the taste or color of your food won’t change when it comes in contact with the surface. So, it is perfectly safe to cook on it. Is it any better than the other pans? The Granite Rock pan is non-stick and scratch-free. So, the coating won’t come off even if it comes in contact with a sharp object. It is manufactured with metal that is non-toxic. So, it is better than the other pans in the market. The Granite Rock Pan reviews are mostly positive. Though some users have mentioned that they on-stick’ nature of the pan is not as good as it is shown on the TV commercial, still Granite Rock pan is one of the best pans you can get in the market. It looks great and has properties like scratch resistant and durability. Though the pan is scratch resistant, it is better not to use metal utensils. Why take a chance to ruin your new pan? The pan is manufactured with layers of coating to ensure that it lasts a long time. It is energy efficient as well as it takes less time to cook. The food is cooked perfectly due to the even heat distribution on the surface. You will create less mess when cooking using this pan. It is also easy to wash. Just remember not to put the hot pan in cold water. Granite Rock pan will provide you a safer and greener cooking experience.